It was while watching Kate Ceberano perform at the Sydney Opera House last year that Christine O’Hagan had the idea of asking the much-loved, award-winning singer/songwriter to sit for her. 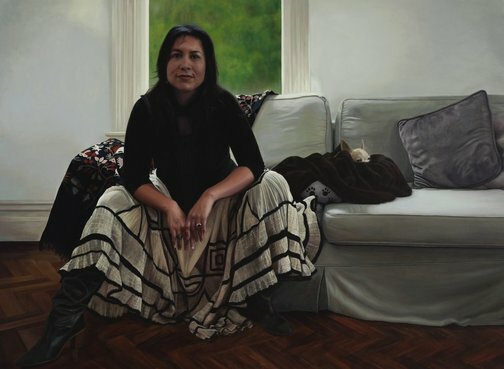 Firing off an email via Ceberano’s website, O’Hagan was thrilled to receive a quick reply from the performer agreeing to be her subject for the Archibald Prize. The sitting took place in the lounge at Ceberano’s Melbourne home. ‘I was greeted by her lovely family and straightaway Kate’s personality struck a chord with me so deciding on the composition of the portrait was easy,’ says O’Hagan. The portrait was painted over a period of four months, using a limited colour palette. O’Hagan says it has been her most challenging work to date but she is ‘fairly happy (the artist’s curse! )’ with the result. Born in Manchester, England in 1953, O’Hagan emigrated to New Zealand in 1975 then moved to Sydney in 1993, settling on the northern beaches with her husband and two sons. She attended local art classes and began working deliberately and exclusively with oil paints. She had her first solo exhibition in Sydney in 2009 and was selected for the 2008 Salon des Refuses.